There are many factors which impact voter’s points of view and one of the most important is the group of influencers which exists in every community. Influencer is the person who has a very strong oppinion and is not afraid to share it or even convince other people to plead for the same thing. Other people are being influenced by them and consolidate their position or sometimes even change ther oppinion. That part of the society is the part which campaign leaders and candidates want to impact the most in election such as US Presidential Election. Thus, we analysed what „online thinkers“ are saying about the candidates and the election itself. Influencers use most of the social networks (if not all of them) and are not afraid to express their oppinion publicly. 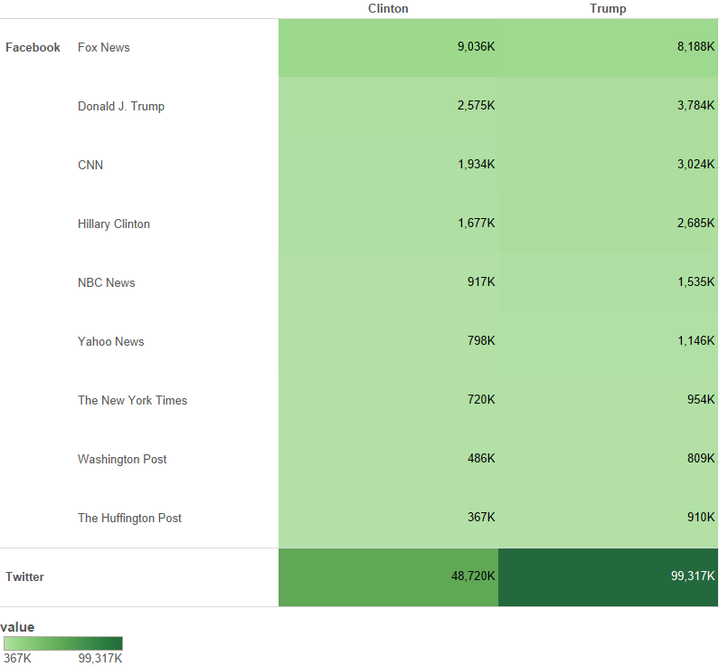 JupiterOne analysed online presence of Hillary Clinton and Donald Trump, providing online presence being the number of messages and mentions. 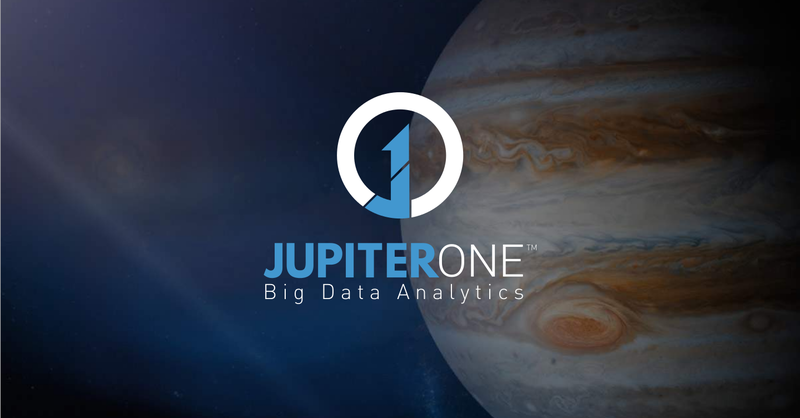 JupiterOne is built to scale up according to source data volumes and used analytics. JupiterOne architecture is based on Lambda Architecture. Main characteristic of this architecture is availability of both batch and speed (real time) layer. Together with serving layer, we have powerful architecture for all kinds of analysis. In the picture below you can see average sentiment by the minute. JupiterOne is based on machine learning algorithm for message scoring. In other words, the graph is showing us the polarity of the comments, 1 being the most negative and 10 being the most positive. Secondly, JupiterOne labels every comment as positive, negative or neutral. You can see that it searches the comment by inserting the key word such as candidate, Clinton or Trump, and labels it. 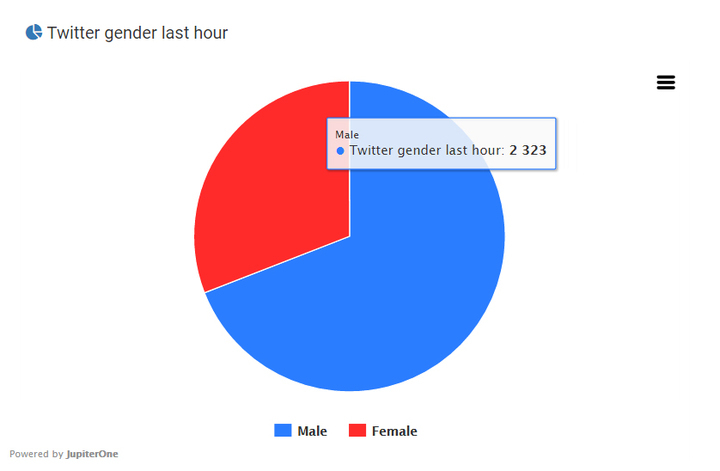 Of course, if we are interested also to see how do Twitter comments and mentions stand on gender distribution in this election, JupiterOne shows you the exact percentage in the time you choose, for example hourly, daily or monthly. JupiterOne shows us the exact amount of Twitter and Facebok messages on the US Presidential Election. The line graph below shows us how their online presence on the mentioned social media sites has changed over time during four months. 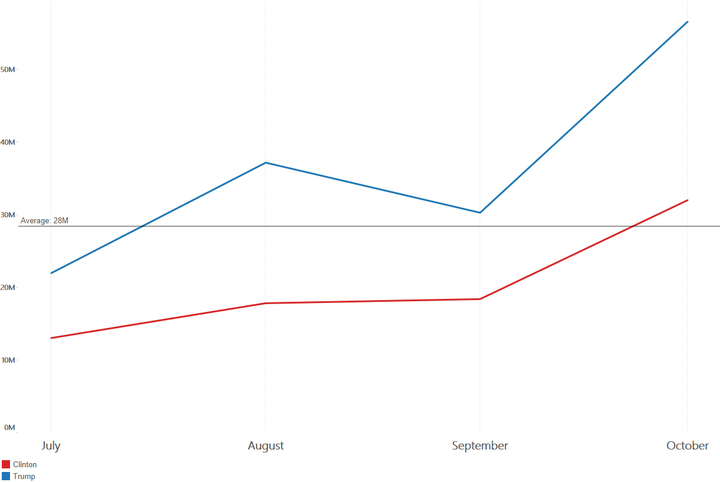 The second line graph shows us how the number of likes and the number of comments have changed during the same period. The closer the election is, the more messages and likes appear online, both of them growing almost proportionally for each candidate. 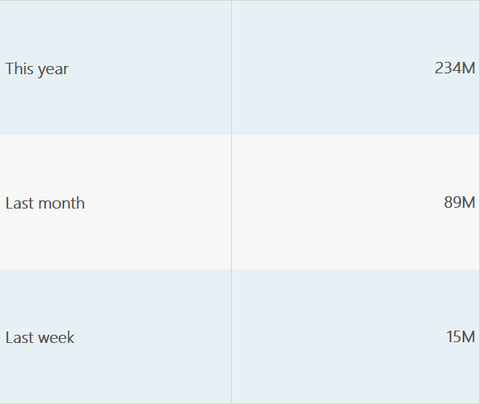 The picture below on the left shows us the number of messages on Twitter and Facebook by the page they were mentioned on during the last three months. These messages are crucial in sentiment analysis. JupiterOne has collected over a quarter of a billion messages supporting or opposing the two candidates in the election, Hillary Clinton and Donald Trump, which can be seen on the picture on the right. JupiterOne analysed messages from Facebook and Twitter. Apart from messages, we analysed hashtags and mentions. 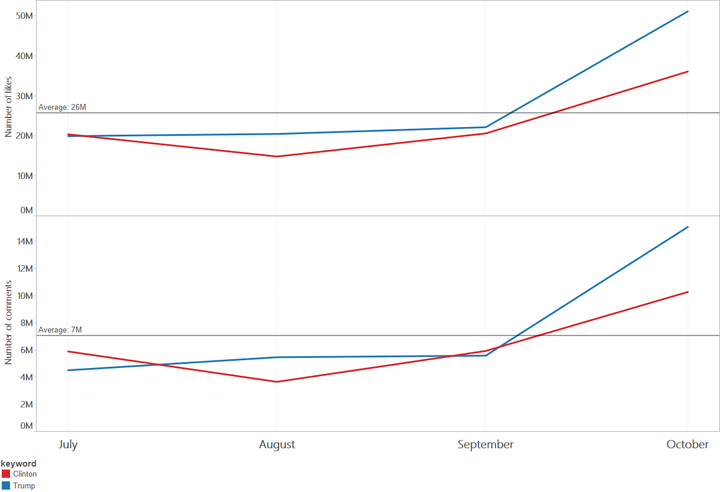 JupiterOne can show you how mentions and comments on each of the candidates has changed over time, esspecialy after every affaire and debate, and some of these changes are shown in pictures above. To conclude, it is clear from the graphs that Donald Trump is more present online. 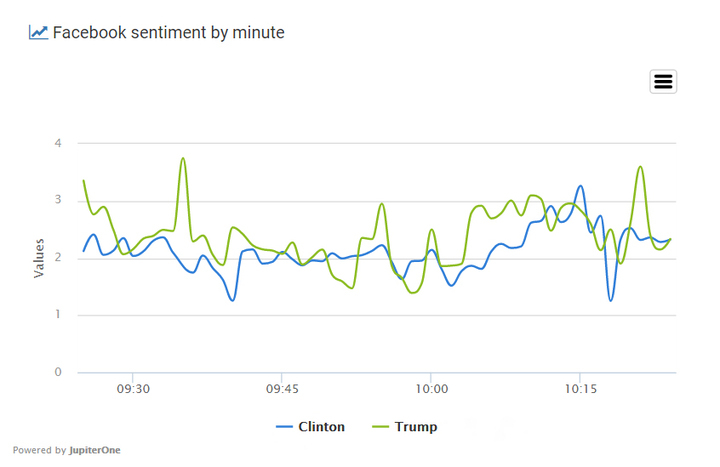 The closer the election is, Trump is prospering more online.